Another tempting e-liquid deal that may interest some of you. 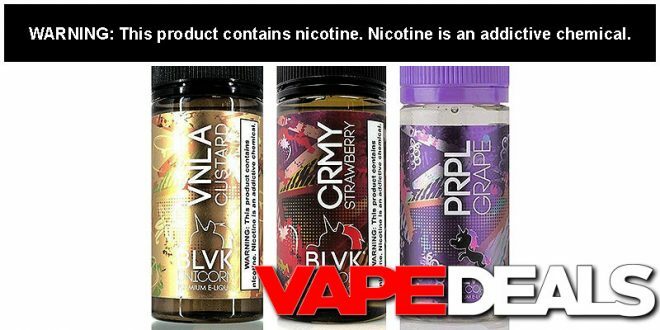 The 100mL bottles of BLVK Unicorn VNLA Custard, CRMY Strawberry, and PRPL Grape are on sale over at Ecig-City for $9.99 right now. Plus, you can still get 15% off if you apply their Valentine’s Day coupon code (“VALENTINES2K19”) at checkout. That works out to just $8.50 per bottle, which is about half the price that most vendors are charging. And keep in mind that that coupon code is valid sitewide, so you may want to have a look around and see what other deals you can find. Don’t wait too long though, it expires in about 4 days (2/14). Ecig-City offers FREE shipping when you spend $50 or more. Please note: due to increased order volume, orders may require 5 – 7 business days to ship.